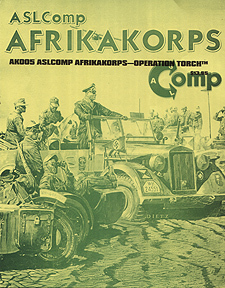 ASLComp Afrikakorps is a series of scenario packs that deliver unheralded desert warfare action for ASLers interested in the ultimate test of tactical-level warfare. All of the scenarios in the set are played on 22" x 34" desert mapsheet using a large collection of new colour overlays to create unique and interesting battlefields. All overlays are blunt cut,there are no hexsides to trim our or fray. What's more, the overlays include desert tracks and villages, making for the most realistic desert battlefield recreations in the history of ASLCComp Variant gaming... and then some! ASLComp Afrikakorps includes the core module Devils Garden, which includes map, overlay collection and Bonus colour die-cut counters. Packs 2-? provide additional scenarios, most built around a specific theme including Operation Torch, Rommel re-taking Cyrenaica, Tunisia, and more. This is not a complete game. Ownership of the ASLRB, WOA (i.e., British, German, American and Italian Nationalities) are required.